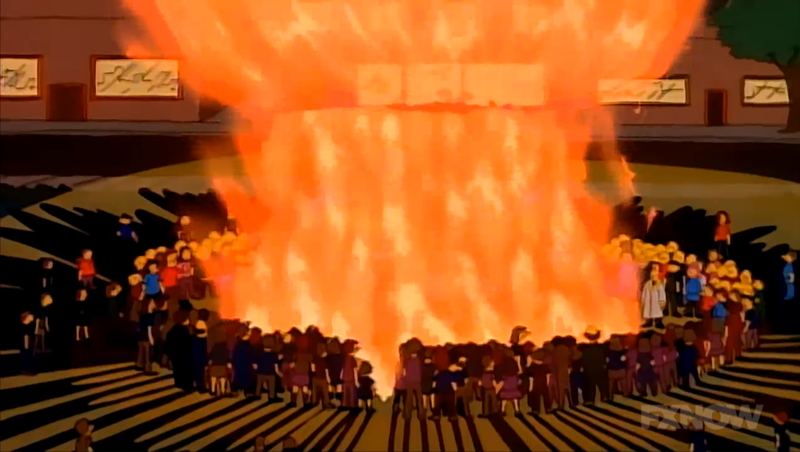 We open on an episode of Krusty the Klown where poor Sideshow Bob has to be shot out of a cannon yet again. 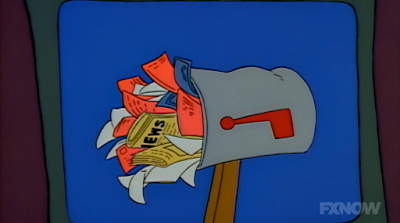 After Marge comments on the violent episode of Itchy and Scratchy where Itchy hits Scratchy with a flaming arrow setting him on fire, we learn that Patty and Selma are coming over to show the family their vacation slideshow. Marge calls Homer and tells him to pick up some ice cream which he goes to the Kwik-E-Mart to obtain. 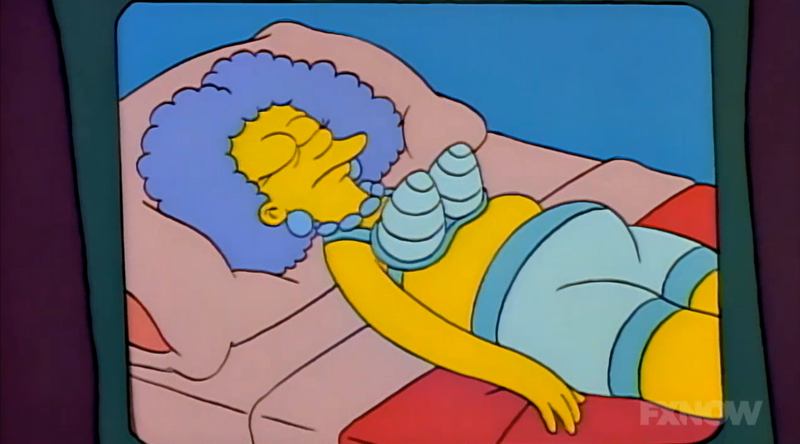 While there, Krusty is there warming up a burrito in the microwave and reading a magazine while wearing a black mask for some reason. 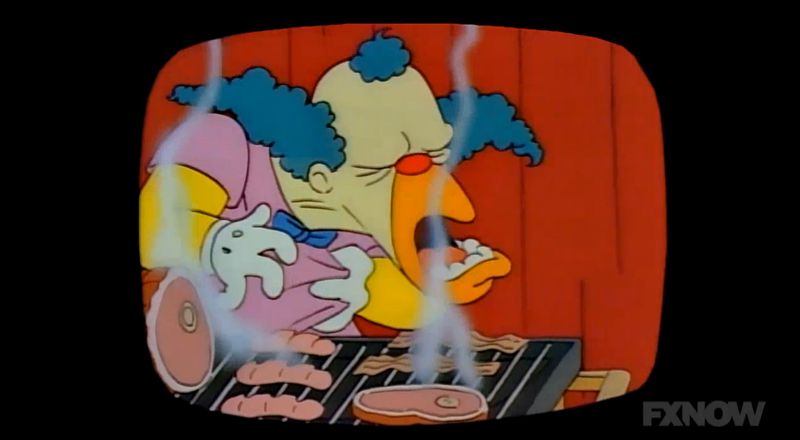 They'll never recognize you, "Krusty". After Homer steps on Krusty's foot, it's learned that Krusty is there to rob the place. 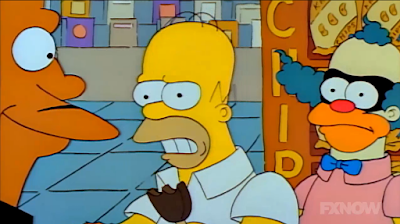 Homer heroically dives into a display of chips while Apu gives Krusty all the money in a paper bag. Homer is able to ID Krusty to the police and Krusty is promptly arrested all before the 10 o'clock news. Bart, upon hearing the news, is heartbroken that his hero is nothing but a common criminal. the California Institute of Art. It has appeared in every movie made by Pixar. Continuing the trend of Springfieldans overreacting to everything, Reverend Lovejoy proposes a public burning of all Krusty merchandise. It goes exactly as you would think. However, Bart is positive that Krusty was framed and enlists Lisa to help him prove it. Their first stop is the Kwik-E-Mart, where Apu is still a little jumpy despite working there for years and being shot numerous times. Lisa notices that the robber couldn't be Krusty because the robber used the microwave and Krusty has a pacemaker. She also notes that the robber was reading a magazine and Krusty can't read. Wondering if Krusty had any enemies, the two of them run off to meet with Sideshow Bob. 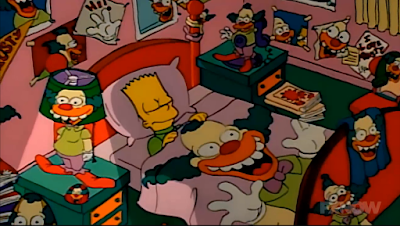 Sideshow Bob has turned Krusty's show into an intellectual's program with readings from "The Man In the Iron Mask" and a segment where Bob dissects pre-teen troubles called "Choices" which Bart reluctantly goes on when Bob notices how despondent he is. As Bart goes through the clues that Krusty was framed, Bob pokes holes in each clue but Bart finally figures it out and proves that Sideshow Bob framed Krusty. As a reward, Bart get a signed poster of himself and Krusty and all of his Krusty merchandise back. Krusty: "How much do you love Krusty?" Audience: "With all our hearts!" 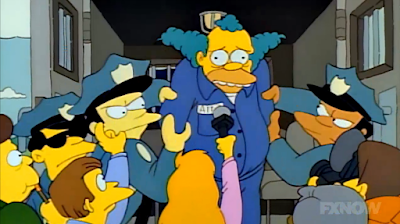 Krusty: "What would you do if I went off the air?" Krusty: "Don't blame me, I didn't do it." All the mail waiting for them upon their return. After Krusty's heart attack and subsequent triple bypass surgery and pacemaker, Krusty becomes an advocate for illiteracy coming up with the slogan, "Give a hoot, read a book!" I'm impressed by how popular Sideshow Bob's show became. Sideshow Bob just happens to have a copy of the Springfield Review of Books on the coffee table during "Choices." Not suspicious at all. 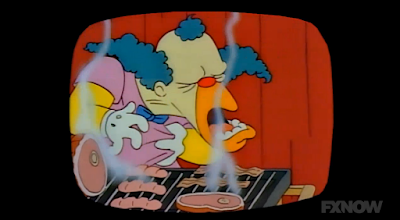 Krusty has a heart attack on live TV.